Subscribe to our monthly e-Newsletter and we will keep you updated with news, special offers and the latest information. Scan and remove all types of malwares. Quick Scan, Full System Scan, Custom Scan, Hidden Process Scanner. Secure Hunter detecting and removing malicious software lurking in startup programs, cookies, and other files and folders. Our support pages are the quickest way to find answers to your questions. Antivirus software is no longer enough to keep you safe online. While viruses are still a cause for concern, cyber threats are being produced that can infect your computer, view your photos, steal your identity and hack into your bank account, simply because you opened a web browser. Unfortunately, antivirus programs cannot detect these threats that’s why you need Secure Hunter. Acting as a sidekick to your antivirus program, Secure Hunter locates malicious software and eliminates it before it reaches your data. A low-cost option for malware protection, Secure Hunter hunts down Trojans, worms, spyware, ad-ware and more, use our cyber security glossary. Available by instant download, Secure Hunter is designed to provide immediate protection against the Internets nastiest bugs. Download Secure Hunter Free Anti-Malware now. Still trying to decide Secure Hunter is available for both personal and business use. From desktops to laptops, PCs are a vital component of everyday life. Whether yours is for work or pleasure, any intrusion into your private space is an unwelcome one. Secure Hunter’s personal anti-malware software was developed specifically for individuals who don’t want to sacrifice privacy when surfing the web. Secure Hunter’s free program immediately scans your system to detect any threats lurking behind-the-scenes. Go ahead share the good news with your friends on Twitter, Facebook, LinkedIn and any other social media you use! 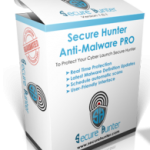 Download Secure Hunter Anti-Malware FREE today to experience worry-free PC security download Secure Hunter FREE today to experience worry-free PC security. Don’t forget to tell your friends on social media about FREE malware protection from Secure Hunter! Got Questions Wev’e Got Answers! Anti-Spyware: Spyware and adware aren’t just annoying, they can slow your PC down. Some spyware is even worse and can steal your data, your identity, and more. Help your friends stay clear of viruses and other e-threats. Share with them this software and help them avoid e-dangers – free of charge!. I am really quite amazed at the user friendliness and handiness of Secure Hunter its so useful!. Whether youre in the planning, start-up or established phase of business, protecting your digital property is a priority. Because most businesses rely upon technology to operate and generate sales, malware can quickly interrupt your day and threaten your livelihood. During the course of a day, multiple users may have access to sensitive business information on every workplace PC. As a small business owner, its important to keep your PC security in check. Even with antivirus protection, spyware, worms and other threats can seep into your system undetected. Secure Hunter Anti-Malware PRO was developed to provide comprehensive malware protection for up to five users, which ensures that your business remains secure. We can help with that, too. By offering both free and paid anti-malware software, Secure Hunter is guaranteed to have the perfect PC security solution for you. Don’t wait another minute, grab Secure Hunter Anti-Malware today the perfect sidekick to any antivirus program! Be sure to share Secure Hunter with your friends on social media! For 24/7 PC security from the pros, trust Secure Hunter PRO to eliminate malicious threats from your digital life. With automated updates and malware scans, Secure Hunter Anti-Malware PRO is always prepared to battle the latest security threats.